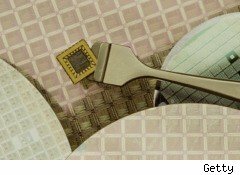 Semiconductor sales hit a new March record, reaching $23.1 billion in the period and further solidifying the industry's growth after a brutal downturn a year ago, according to the closely watched Semiconductor Industry Association (SIA) report released Monday. The month's sales mark the second-best period on record after November 2007. In March, worldwide chip sales rose 4.6%, compared to the previous month. Growth rate comparisons from a year ago were much more stark, soaring 58.3%, thanks to an easy comparison when the industry was hitting a low point and struggling to emerge from a dour economy. The SIA's report, combined with Wall Street's recent revisions on forward-looking earnings estimates for some of the larger players in the chip sector, not only bode well for the semiconductor industry but also PC and cell-phone makers that rely on the components. Year-Over-Year Growth Rates "Will Moderate"
"The current results reflect improved sales in a variety of market segments, including the enterprise sector where recovery has been slower than in the consumer sector. Healthy economic growth in China and growing demand for PCs and cell phones in developing economies were major contributors to growth in the first quarter," said SIA President George Scalise in a statement. For the first quarter, chip sales reached $69.2 billion, up 58.4% from a year ago. "Healthy demand from major end markets coupled with restocking to normal inventory levels contributed to strong first-quarter growth," Scalise said. "While we expect that 2010 sales will continue to be strong, the year-on-year growth rate will moderate going forward, reflecting the industry recovery that began in the second half of 2009." Shares of Intel (INTC) and Advanced Micro Devices (AMD) were both up slightly in premarket trading.